Other Distinguishing Features: The surface of Rock’s entire body consists of a granite-like substance. Rock has no hair and no visible nose or ears. Rock has tiny ruby-like eyes. Joe Manning married Marika Washington, the girlfriend of his best friend, Tyrone Jefferson, after he died in a car accident. Their relationship was rocky from the start and they had financial difficulties that were only compounded with the arrival of a daughter who they named Gina. When Joe was exposed to hazardous material in his job as a part-time janitor for Rikko Chemicals, he went through a disturbing physical transformation. Unable to deal with their medical expenses and repulsed by his appearance, Marika left her husband, later filing for divorce. After his condition had stabilized, he was released from the hospital. Rikko Chemicals didn’t give insurance to part time employees and he had been forced to sign a release to get the job so that the company wasn’t held liable for any resulting job related injuries. Joe was destitute. He became a homeless freak and went to Chicago to live with a group of transient freaks that lived in an underground portion of the city. Assuming the name Rock, Manning became the leader of this homeless band of undesirables. Rock encountered Officer Dragon of the Chicago Police and the costumed adventurer Star when they came across their underground lair while searching for the escaped criminal Octopus. Soon afterwards, Rock and some of his fellow freaks (Shrew, Beast Boy and Widow), attempted and failed to stop the Dragon’s rampage when he was under the mental control of the villainous Horde and was destroying the city of Chicago. A wedge was driven between the Underground Freaks and the Chicago Police Department after several officers attempted to “evict” the homeless freaks from the underground, where they were trespassing. Rock persuaded the officers to give up after the Dragon was abducted by the third incarnation of the Fiend. A week later, the Underground Freaks were kicked out of their home by the Vicious Circle whose new headquarters was nearby. The group relocated to an abandoned church and joined in the fight. 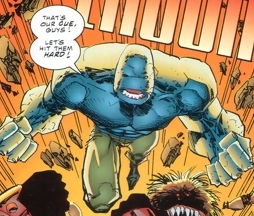 Rock led his allies against the Vicious Circle in the aftermath of the Martian Invasion of Earth, alongside Freak Force and the Chicago Police Department. All of Rock and his people’s previous encounters with the Dragon convinced the hero to recruit them for the United States’s new super-team, the Special Operations Strikeforce. Although a number of freaks were rejected for membership, several were accepted and accompanied Rock to Washington, DC to begin their new lives. Following the mission to Darkworld that left Dragon and Smasher missing, Rock was awarded leadership of the S.O.S.. The team’s directors, Stephenson and Hawkins, had doubts over the abilities of Dart and it was decided that Rock would be best to assume command. Even after Dragon returned, Rock remained leader of the team, and the Dragon returned to Chicago to form a new S.O.S. division. Rock proved to be a natural leader for the government’s elite team and he maintained this role for a number of years, guiding his teammates to victories over a large number of foes. On his final mission as a superhero, Rock joined with Sgt. Marvel to lead the entire roster of the S.O.S. to a facility where the second Nega-Bomb was being held. They were at ground zero when the device detonated and annihilated the team, reverting them all to their natural states. In the reality that Dragon ended up living in, the history of the Underground Freaks was vastly different. They never emerged to the surface and spent the entirety of CyberFace’s reign hidden underground. Their numbers were thinned out over the years and when Dragon arrived in their home, they were reluctant to join his rebellion. Rock eventually led his companions to join Dragon and they helped overthrow CyberFace. Once this global threat had ended, Rock was aided by Dragon in setting up a new home for his adopted family on the surface. He married Widow and adopted her daughter Janey. Rock was then able to purchase a restaurant that he named the Rock House Diner. Rock largely avoided crime fighting and merely went into action when villains attacked his diner. The threats of the Vicious Circle, the Billy Berman Mighty Man and Universo prompted Rock to head into action again. He also became part of Mister Glum’s superhuman army during the alien dictator’s enslavement of humanity. Rock remained dedicated to his business and family and prefers the quieter life to fighting super-powered threats. Eventually his diner is destroyed due to the Claw’s invasion of Chicago.